My daughter has been wanting me to make blueberry scones for awhile, so I found a great sounding recipe from Tyler Florence at Food Network. The reviews were basically good; some thought the dough too crumbly. Some thought it too wet. Some thought it was perfect, so I chose to believe them! 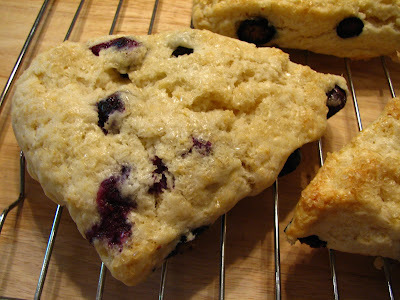 These scones are very light, with a tender crumb, and they melt in your mouth! The butter and cream ensure a wonderful flavor along with the blueberries. The glaze is supposed to be lemon, but my daughter doesn't care for lemon and blueberry, so thus the change to orange! The flavor of the orange with the blueberry was amazing! On some of the scones, I had sprinkled coarse sugar before baking, so they had a bit of a crunch, which we like. On the other half, I used the glaze, which has a wonderful flavor! I had made only half of the glaze and it was waaay too much! I drizzled on the glaze after the scones had cooled for a few minutes. The glaze is wet, which left the scones wet, in my opinion. If you can eat all of the scones in one sitting, it's no problem, but if you're going to have to save some for the next day, I'd advise serving the glaze in a small pitcher for individual use. This glaze is runny and even in the fridge it didn't thicken much. You can see the glazed scones in the picture below. The next morning they were softer than I like, but we ate them anyway. I'm not one to waste food, unless it's just gross, that is! My daughter much preferred the scones with the dusting of the coarse sugar. After saying all that, I will definitely make these again! They have great texture and flavor and I'll serve the glaze on the side. Preheat oven to 400 degrees. In a bowl, sift together the flour, salt, baking powder and sugar. With a pastry blender, cut in the butter until the mixture looks like coarse crumbs. Make a well in center of flour and add the cream. Fold everything together gently and add the blueberries and fold in. Do not overwork the dough. I found it hard to fold in the berries, so I used my hands to fold them in gently and just pushed the dough into a ball. On a floured surface, place the ball of dough and press into a circle that is about 1 inch thick and about 6-8 inches in diameter. Cut into 8 wedges and place on an ungreased cookie sheet. Brush tops with a little cream. Bake at 400 degrees for 15-20 minutes until golden. 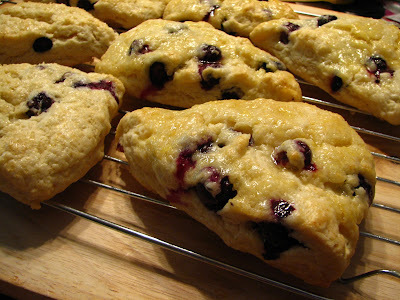 If using the glaze, let scones cool a bit before applying glaze. To make the glaze, you can make it in a double boiler, or a microwave for 30 seconds on high. Mix juice and sugar together; add zest and butter and stir until smooth. Let it set a minute before serving. Enjoy! In the above pic, the scones with the coarse sugar are on the left, the glazed on the right. Both tasted delicious and I've added this recipe to my list of keepers! It's hard to eat just one! These really do look good. I'll bet they were awesome to eat. Lynda, you are a star! The only time I made blueberry scones they came out looking like moon rocks. Really! I haven't gone near THAT recipe again. I'm giving yours the Big Eyes, however, and as soon as blueberry season comes 'round here, these will be on a plate near me! They look simply scrumptious! 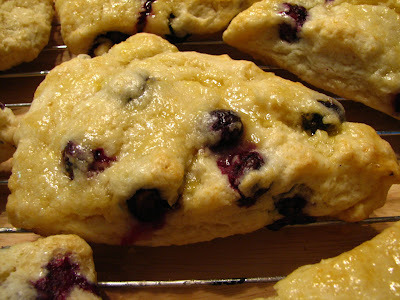 I've made orange scones but love the idea of using blueberries and oranges together. These look very moist. Orange is a wonderful flavor to pair with blueberries! I've never made scones, but do love them. I have never made scones. This is a great flavor combination. I should give it a try! i love any blueberry treat, i think that's pretty safe to say. however, with these, the glaze is what makes them irresistible. nicely done! Now this is my kind of breakfast treat - they look absolutely perfect. These look so tender and that glaze makes them look beautiful! They do look really tasty! Thanks for the tip re the glaze. 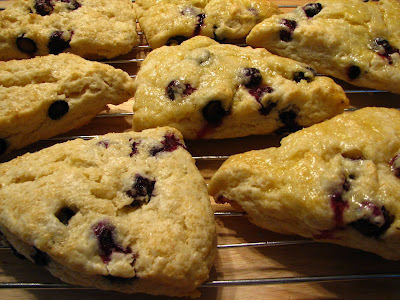 Yummm... the bluebery scones look so yummy! These look delish! Good idea about leaving off the glaze. You could probably even freeze them that way and just whip up the glaze when you are ready for round 2. I also hope that your MIL is feeling much better and is recovering from her scare a few days ago! I am finding blueberries on sale here and they are big and plump, so they are finally in season!!! I''l have to try your scones...they look wonderful! I bought two containers of blueberries at the farmers market so I would really like to give them a try. I was going to make blueberry muffins again but maybe I'll do this instead. Problem is that I'm not a good baker and always thought scones were hard. Your recipe doesn't seem hard though. I think I'll top mine with vanilla sugar and skip the glaze altogether.